Delivery of video files is a complex issue due to the large number of options for formats, codecs and settings. And unlike still images, video files are often too large to deliver over the Internet easily. This section will outline some of the most important considerations, and present strategies for successful video file delivery. The delivery stage for video can be plagued by problems. With the myriad of different playback devices as well as technical standards, it is very easy to make a mistake at this stage. The problem with video delivery can be traced back to an overwhelming number of technical options available. Are you delivering to tape, DVD, hard drive, Blu-ray, the Internet, a portable media player, a tablet, a smartphone...? The list seems endless. In most cases you’ll need to deliver multiple file formats to satisfy the needs of your customer. These individual file formats often require additional versioning of multiple sizes and data rates which can vary greatly in order to ensure compatibility of the playback device. Figure 1: A sample of some of the choices you’ll need to make when compressing a video file for web delivery. It will seem that as soon as you lock down your specs, the rules will change. For example, the video maximum playback size and data rate for Apple iOS devices varies from device to device, with each newer version supporting higher resolution and playback quality. Do you target broader compatibility by meeting the minimum specifications, or do you create unique files targeted for each device? Let’s outline the issues. You will need to determine the deliverable formats so you can complete your projects successfully. In some cases (such as when working with television networks or ad agencies), you may find that deliverables are clearly listed. In most cases, however, you will need to help guide your client to the correct answer. The goal here is mutual understanding that allows the client to achieve their objectives for distribution. What resolution and frame rate is required? If you haven’t answered this question already with questions about usage, you may need to get very specific. Sometimes the shooting format will exactly match the delivery format, but that is pretty rare. You’ll want to clarify if your client needs High Definition, Standard Definition video, or both. Are there any specific sizes needed for the web? What formats or codecs does the client prefer? Beyond file format, there are often video and audio codecs that come into play. For example, if your client says they want a QuickTime movie, that’s not nearly enough detail. 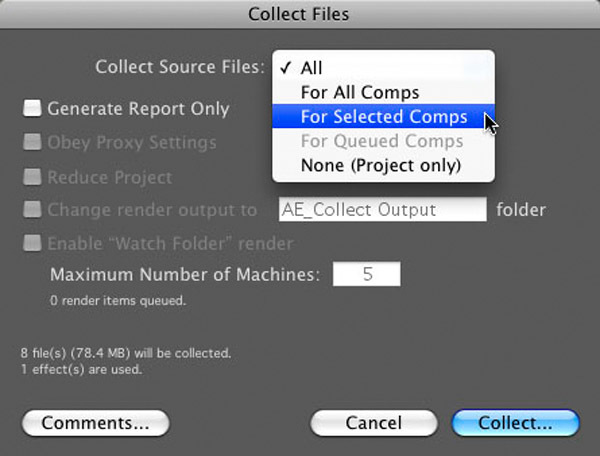 Do they want a mastered file using the Apple ProRes or Avid codec? Are they looking for an H.264 file wrapped in a QuickTime wrapper? Attention to detail helps you to get things right. Figure 2: Many compression applications offer presets based on the output device being targeted. What class of deliverable does the client need? When working with a client, you need to make sure that they are prepared to receive the files you’re delivering. Just as with still photography, it’s important to choose the right way to format the deliverable. A layered Photoshop file may be difficult or impossible for some clients to open. And a savvy client who needs to make edits may be just as dissatisfied with the compressed JPEG you send via email. You might also hesitate in handing over all of your images from the shoot if you didn’t pre-negotiate the terms. The same situation exists with video files. You need to clarify what class of file the client is prepared to receive. Ideally this discussion would have happened up front (as it will often affect the cost of the project). Here are several classes of deliverable to discuss with your client. Digital Master – As the name implies, a master file generally refers to a single, self-contained digital file that matches or exceeds the codec quality of the original camera acquisition. In most scenarios, the final video gets compressed or converted for multiple uses. Because of all this reformatting, it’s really important that you start out with the best quality image that you can. This file should be created with a very high quality codec, rendered at very high quality settings. Common choices include ProRes, Avid, and Cineform. Mezzanine Files – A Mezzanine file is a lightly compressed master file that will stand up to making additional compressed versions.The use of mezzanine files is popular as they simplify the process for most users. In this case, a high-quality file is created using minimal compression. A popular choice is to use the H.264 codec, but with a data rate that is much higher than a DSLR camera. The file is smaller and easier to backup or transport, as ome compression is applied, meaning that the file can be more easily shared or transferred using the Internet. However, the data rate is high enough that the file can be easily re-compressed for smaller sizes. Compressed Deliverables – This category of files typically refers to a wide range of files designed for playback on the web as well as consumer electronic devices and portable media players. It is quite possible that this list can grow into dozens of files quickly if you optimize for individual devices. If you are creating these files for your client, be sure to budget output and testing of each deliverable on a version of the intended playback device. Project/source files – This is a large area of conflict between client and vendor. The client may expect that video projects are works made for hire and expect that all footage you shot, as well as the project files for video editing and graphics, are bundled up and turned over to them. This opens up a myriad of potential issues and clearly shows where the video and photography industries differ on standard business practices. If you do deliver project and source files, most nonlinear editing tools have a media or project manager that can simplify the process. Figure 3: Most nonlinear editing applications offer a project or media manager that can be used to gather up source files for an archive. Configuring output for file delivery correctly can be a challenge. Fortunately, your software tools can truly help, provided that you keep them up to date and you learn to make use of compression presets. The output presets that are included in most editing software keeps the guessing and testing out of file delivery settings to a minimum. Why presets are useful – There are a lot of different file formats as well as a myriad of potential playback devices. The good news is that you can usually trust reputable software manufacturers to keep their paid software products up to date. By using the preset that matches your identified delivery target (such as iPhone 4S, DVD High-quality, or YouTube HD), you stand a reasonable change of getting the complex balance of frame rate, frame size, data rate, and codec correct. Keep your software up to date – Because devices keep changing all the time, it’s very important that your compression software stays current. You will come to rely on presets for most target devices. Keeping your software regularly updated (with both paid and free updates) will improve the chances of correctly compressing files. Verify your settings – While it’s a good idea to trust the settings in a compression application, its a better idea to verify them. After you do a few test compressions (using a short excerpt for your longer video), try transferring that file to the targeted devices and playing it back. If it’s going to be a DVD, burn it and try it in a few players. Plug in the iPad and transfer the file. You need to ensure that what you think is going to work actually does. Otherwise be prepared for the client to call. 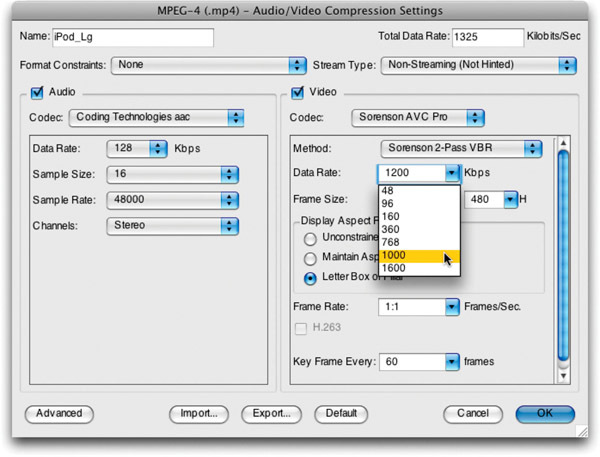 Figure 4: Apple Compressor provides presets for Apple devices which are frequently updated and tightly match the recommended settings for playback on the company’s portable media players and phones. There are several ways to deliver video files. The key here is to remember that not all methods work for every file type. Hard disk – The use of drives to shuttle video is quite popular due to larger file sizes. This method is best for consolidating large projects for an archive, or delivering digital master files. Optical disc – A DVD or Blu-ray disc is an affordable option for transferring a lot of data. Each of these can be formatted as a data disc, or it can be formatted for set-top playback. Make sure you and your client are clear about which one you are delivering. If you are using an optical disc simply to transfer data, it will not offer video playback functionality. It is necessary to compress and optimize the video for set-top playback as well as author a functional disc using an application like Adobe Encore. FTP – The benefit of using a FTP server is that it allows for the transfer of larger files without the file size limits of email or file sharing services. An FTP connection can often be resumed after interruption, meaning that a large upload or download can be “joined in progress” if the connection is temporarily lost. Upload to hosting service – In many cases, your client will simply want web-ready files to add to their website or social media efforts. In this case, the end goal may be simply to post an HD version to sites like YouTube, Facebook or Vimeo. In fact, some of the video hosting sites (such as Vimeo) can store the originally uploaded file as a backup as well. Tape – The use of digital video tape is still a popular option for many video workflows. While formats like DV and HDV are relatively affordable (often requiring only the deck and a FireWire cable), other options can be much more pricy. If you want to use professional HD formats, you’ll often need to invest in a dedicated video interface card for your computer ($1–$3K) as well as the deck itself ($12–$120K). Even HD tape stock can often cost upwards of $300 a tape. Many professionals instead will rely on larger post-production companies or duplication services to make tape copies from files provided on a hard drive. Just as you might watermark a photo before posting online, many choose to do the same with video files. A watermark is a useful way to establish ownership and reduce the risk of piracy. It can also be useful as a device to clarify that the video is merely a draft copy or not approved for external use. In the editing application – You can easily use the titling tool in a nonlinear editing software application or add a graphic file to the video track. The layer will simply be visible above the video and will continue with the file when you export it. In the encoding application – Many video compression utilities allow you to specify a watermark file. Typically this is a graphic with transparency (such a a PNG or TIFF file). It is best to size the graphic ahead of time. Typically these are positioned in one of the corners of the video. In the web player – Some video hosting sites offer the ability to insert your logo into the player itself. 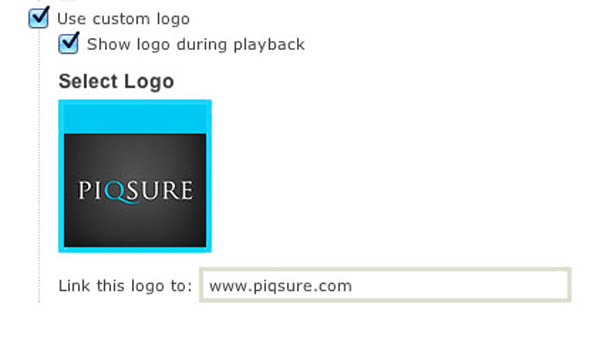 This is also an effective way to attach a logo and a link back to your website. 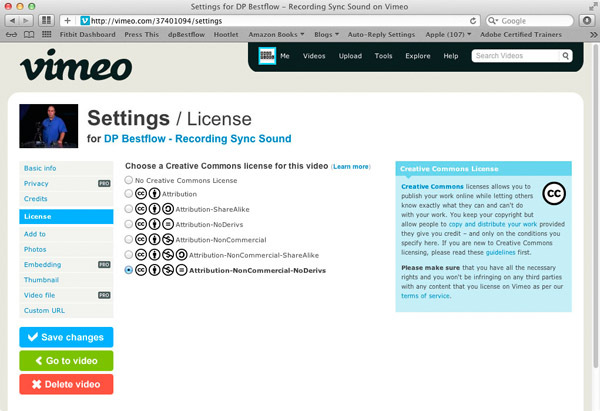 Figure 5: The Plus and Pro accounts at Vimeo allow for a custom logo with URL to be inserted into the video player instead of the company’s Vimeo logo. For many, getting footage into the nonlinear editing application is the easy part. It’s the process of getting a master-quality project out for archival purposes that is so challenging. The sequence should be "picture-locked" meaning that no additional changes will take place to the sequence. While each editing application will have its own unique steps for exporting a project, the process is pretty standard. Use these steps to create a master file. Make sure that the whole sequence is rendered. Click in the timeline and choose Select All, then render the clips. You may also need to set the work area or use In and Out points to define the range to render. Mark an In point at the start of the footage you want, then mark an Out point at the end of the range. For most editing tools, you can use the keyboard shortcuts I and O for In and Out respectively. Look in the file menu or application menu for an option to export the file, (it will most often be labeled File>Export). Choose this option. Export the file using the same high quality settings that you were editing with, meaning the same frame size, frame rate and codec. If you’re using a heavily compressed file format for editing (such as H.264), consider using a codec like Apple ProRes, Avid, or Cineform. Save the file to a location of your choosing, keeping in mind that the file you export will be large so choose a location that has enough storage space. Archive the file using multiple backup methods including optical disc and magnetic tape. When you need to deliver files to a client, the use of compressed files is common. For some clients, an optimized file may be all they can review (after all professional tape playback is only used in higher-end workflows like broadcast). Even the most technically-advanced client will still likely want optimized files for distribution over the web or through optical discs. Multi-processor support – Video compression is a processor-demanding task. Newer software may support multi-threaded operations. This will have the biggest impact on the speed of output. H.264 support – Make sure that the encoding tool can create using the versatile H.264 format that is the preferred option of most video-sharing websites. Customized presets – An important feature is the ability to modify presets or create your own. By storing customized presets, you can ensure consistent results that are tailored to fit your client’s needs. Batch processing – The ability to batch process files is an essential timesaver. It allows you to add multiple files to the encoding tool, and then apply presets to the files. This essentially means that the time-intensive tasks of compression can be run as unsupervised jobs overnight or on weekends. This is an effective way to make money or at least save time as it allows you to focus on other tasks. Compression previews – Some applications let you see a preview of what the file will look like after compression. This is useful as you adjust quality settings. Figure 6: Sorenson Squeeze (and other professional compression applications) let you view the original file next to a simulated preset to show you the effects of compression. As web video has become the dominant standard for video consumption, there are many affordable (or even free) options to create optimized video files. The biggest difference here is that many of these tools lack batch processing and often offer minimal support for customized presets. QuickTime and QuickTime Pro (www.apple.com/quicktime/pro) – This versatile tool makes it easy to convert video from one format to another. QuickTime Pro is a cross-platform solution and lets Mac and Windows users convert video files to work with Apple’s portable media players. The files QuickTime produces are very compatible, but don’t offer as many options as other tools. A version of QuickTime that can create iOS-compatible files is included with newer Mac operating systems. The more versatile QuickTime Pro sells for $29.99 and is a preferred tool for most media pros’ toolbox. iTunes (www.apple.com/itunes) – While generally thought of as a media player, you can use iTunes to convert incompatible media to an iPod/iPhone-ready format. Additionally, iTunes is essential for testing your files to see if they are compatible with Apple’s portable media players. iTunes is a free, cross-platform solution. MPEG Streamclip (www.squared5.com) – MPEG Streamclip is a powerful video converter, player, and editor. It works on both Mac and Windows. It can encode to many formats, including podcast compatible formats; it can also cut, trim and join movies. The biggest benefit, it’s free! Stomp (www.shinywhitebox.com/stomp/stomp.html) – This Mac-only tool bridges the gap from consumer to professional. It offers an easy-to-use interface but also unlocks filters and customized presets. The tool produces great results and offers excellent visual feedback when changes are made to a clip. 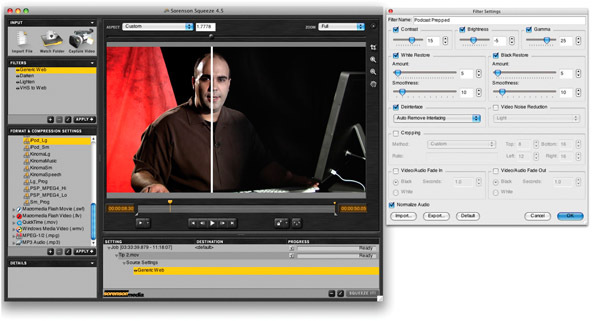 Another unique feature is that the tool offers Core Image Filters, which are very fast and can perform tasks like color correction. Microsoft Expression Encoder & Expression Encoder Pro (www.microsoft.com/expression/products/Encoder4_Overview.aspx) – This PC-only tool comes in both a free and a Pro version. It replaces the Windows Media Encoder, which was retired in mid-2010. It can create both Windows Media Video and Silverlight files. The Pro version can also output H.264 and AAC files. If you work with professional-level video editing tools, there are often professional-level encoding tools designed to match. These tools tend to offer speed benefits like multi-processor support and batch processing. They also tend to ship with a more flexible system of presets and support more file formats. Sorenson Squeeze (www.sorensonmedia.com) – Sorenson offers several variations of their Squeeze product line depending upon features that you want. This is a cross-platform solution and is very popular due to its ease of use. The product’s price varies depending on whether you need Flash Video support and which platform you choose to use. 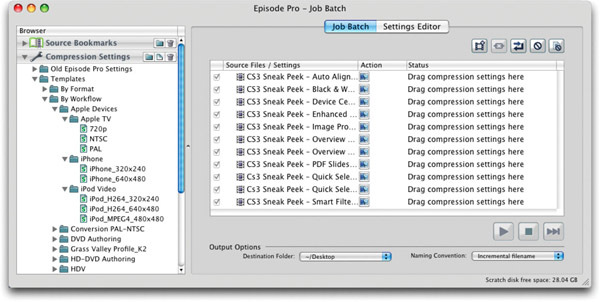 Telestream Episode and Episode Pro (www.telestream.net) – The Episode Series offers several options for encoding media to several formats. The products are also very fast and have had frequent updates with improved features. Apple Compressor (www.apple.com/finalcutstudio/compressor/) – This powerful compression tool used to be included with Apple’s Final Cut Studio bundle and is now sold as a standalone application through the Mac App Store. It has full support for batch processing and filtering. Adobe Media Encoder (www.adobe.com) – The Adobe Media Encoder is not a stand-alone product. Rather it is a core technology in the Adobe Creative Suite products that work with video. You can easily access it through products like Adobe Premiere Pro. It supports several formats, and offers excellent control. While you’ve likely put a lot of work into your finished video, it is just not practical to deliver uncompressed video over the Internet. Uncompressed video formats can top out at gigabytes per minute which would cost a fortune to deliver and even the most motivated audience members wouldn't be willing to invest the time in getting content. The good news is that video compression techniques for the Internet have come a long way in the last 20 years. It is now possible to deliver video that looks great using data rates that measure 1–10MB per minute. In fact, adaptive streaming technology has allowed video viewing on smart phones to grow enormously. The real challenge is having video still look great after you’ve discarded 95% or more of the video information. Figure 7: Be sure to give YouTube the highest quality source you have available from the frame size point of view. It is okay to pre-compress the file to a high-quality H.264 file to speed up the posting process. Getting video to look good for the web is a three-sided challenge. The right encoding technique balances file size, speed of compression, and visual quality. Getting a small file size with good image quality is not easy to do. Likewise, you can usually generate high-quality files quickly using default presets with the encoding tools. But the files will be unnecessarily large. Of course, you can make small files quickly by just throwing away information. But these fast-encode methods don’t deliver great looking files. Check for upload limits – You'll often have a cap on runtime and file size. Be sure your video falls beneath both or it will likely be rejected. Check your options – Most sites will accept several different upload formats. You are best compressing the video to an intermediate file that meets the upload requirements. Most sites accept H.264 video files, which offer a good balance of image quality to file size. Test post – Before you upload several clips, be sure to test post. Try out a compressed file and see how it looks. Find the right balance of image quality to file size in order to maximize the video's appearance online. 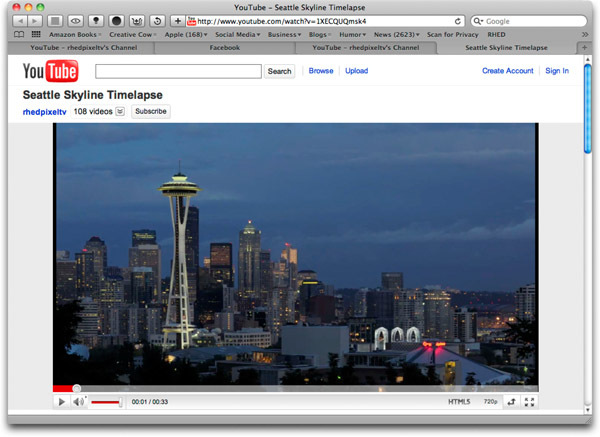 Look for a preset – Some tools offer useful presets for popular sites like YouTube and Vimeo. Sticking with these presets can sometimes bypass the site’s tendency to re-compress your footage as it may detect the correct bit-rate and codec options present in your uploaded file. Figure 8: Learn how to export video from your nonlinear editor to make sure your movie is ready for the web. When you compress video, you may have the ability to insert metadata into the file to describe things like copyright and crew credits. Unfortunately, most websites ignore or strip this information during the upload process. We highly recommend reviewing the information shown for your file after upload, in order to determine if the tags have been stripped. In most cases, video sharing websites will allow you add information to the posted video. Figure 9: If the site offers the ability to specify a license, take advantage of these features. These can help protect your rights. Figure 10: You can also upload credits for your crew.. While web delivery may be used to successfully send video files to many portable devices (such as smartphones or portable media players), these devices warrant special mention. For the best end experience for your audience, there are benefits to creating files optimized for a particular format. As content producers, it’s our job to produce media files that will work on multiple devices. While devices like the iPod and iPad have become ubiquitous in modern culture, they still vary wildly from each other. The best option is to verify that the settings you want to use will work for the intended playback device. Always view the manufacturer’s website and review the delivery format for a particularly device. Before you send your video out the door to a client (or even your audience) be sure to thoroughly test it. 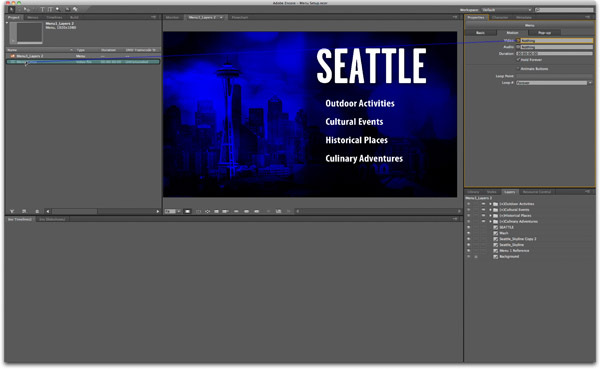 Always test each web video preset you intend to use by taking it and running it on a clip. Then take the resulting file and transfer it to an intended player. If the preset says its for an iPod, put the file on an iPod and an iPhone. If you are required to deliver on DVD, burn a disc and play it on a television. You need to test your settings because something can go wrong with the file. Before you compress a lot of video, create a small test file. Try compressing 30 seconds of video with different settings. This test file should ideally include a mixture of footage and graphics that will be in your final shows. The goal is to find compression settings that work well with your material and are also compatible with the technology your audience wants to use. Figure 11: There is no replacement for testing your compressed files on the intended playback device. The delivery of video through optical disc has grown in popularity due to consumer demand. The use of DVD and Blu-ray Discs allows for the easy transfer of high-quality video to consumers. The technology has also proved easy to use, which has led to quick adoption. Optical discs are a very affordable medium, with DVDs costing a few cents and Blu-ray at around a dollar a disc for the blank media. The discs are also relatively sturdy (compared to hard drives). You can transport optical discs easily through the mail or in portable cases. Optical discs are not infinite in size. A DVD can hold 4.7GB of data while a Blu-ray Disc is better suited for HD video with capacities of 25GB. (These figures are for the less expensive single layer discs. For dual layer, the price of blanks can go significantly higher for Blu-ray discs). The discs can also be scratched or cracked if not kept in their protective cases. In this section, we’ll look at preparation of discs for set-top playback, as opposed to delivery as a data disc. The first step in creating any DVD or Blu-ray for delivery is to properly encode your video. This task is typically handled by the same video compression software you use to make web video files. BD file formats – Blu-ray discs can use either MPEG 2 or H.264 encoded video. However when encoding video for Blu-ray we’d urge you to use the more modern and thus more efficient H.264 codec. Figure 12: Adobe Encore is a cross-platform solution for creating DVD and Blu-ray Discs. Use variable bit-rate encoding (VBR) – Variable bit-rate (VBR) encoding adjusts bit rate depending on the subject mater that is being encoded. If a shot is simpler with less movement, the total bit rate will be reduced. VBR encoding is more efficient and leads to smaller, better-looking files when compared to constant bit-rate (CBR) encoding. Use progressive sources where possible – For both DVD and Blu-ray you’ll get better results from MPEG2 and H.264 encoding when your sources are progressive. When creating DVDs or BDs, you have two choices in manufacturing the optical discs. If you’re dealing with small quantities, you can use the optical burner or disc drive with your computer. These discs are easy to make, but may not be as compatible in all players. If you need to produce discs in larger quantities, the use of replication is preferred. In this case, a master disc image is created (often called the glass master). Discs can then be created using specialized hardware that creates the discs much faster and with greater accuracy to prevent errors. This process is typically used for orders above 500 discs. Unless you are publishing the video yourself, you’ll likely need to create multiple outputs for the next person in the chain. Perhaps it’s your client who is looking for final distribution files or another post-production professional (such as a colorist) who will continue to work with the project. This File Delivery Checklist can be used to facilitate collecting the information all parties need for smooth handoffs of digital assets files from one person to another in a post-production chain. As a photographer, you may often want to insert photos into your video productions. The best approach here is to pre-process the image using an image editing application. This allows you to crop to the correct size as well as make other essential adjustments. Figure 13: Learn how to adjust photographs in Photoshop to make sure they are ready for your video project.